1 of 4 Heat oven to 450 degrees F. Bring meat to room temperature by letting it rest on a cutting board for at least 30 minutes. Place a rack in a shallow roasting pan. 2 of 4 Slice 2 of the garlic cloves into slivers. Chop remaining clove. Using the tip of a small knife, cut slits in meat deep enough to hold garlic pieces. Tuck garlic slivers into fleshy part of roast. In a small bowl, combine oil, chopped garlic, dry mustard, rosemary, thyme leaves, salt and pepper. 3 of 4 Place roast, rib-side down on rack in pan. Rub with herb mixture. Transfer beef roast to 450 degrees F oven and roast for 25 minutes. Reduce oven temperature to 375 degrees F and continue to cook for an additional 1 hour and 10 minutes, until meat registers 135 degrees F on an instant-read thermometer for medium-rare. 4 of 4 Remove roast from oven; tent with foil. Let rest 15 minutes. Meanwhile, prepare Horseradish sauce: In a small bowl, blend sour cream, horseradish, mustard powder and black pepper until smooth. To serve roast: Beginning at rib top, slice down along curve of ribs to separate meat from bones. 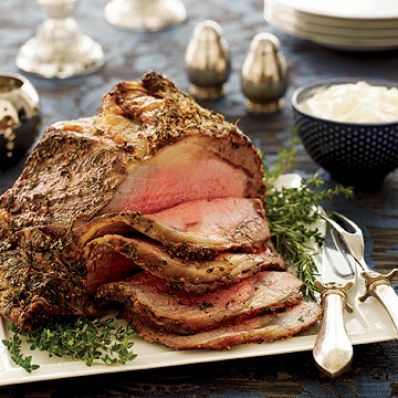 Cut roast into 1/4-inch-thick slices and serve with horseradish sauce alongside.